1. 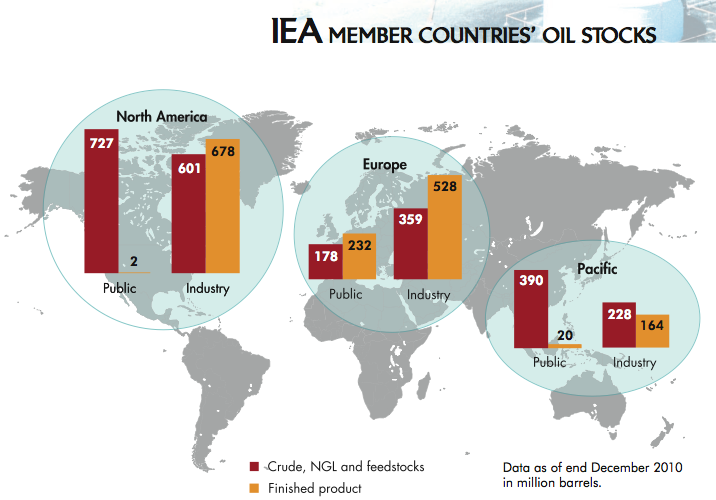 IEA stock levels in days of previous year’s net imports using http://www.iea.org/methodology.html Total may not equal sum of Industry and Public due to rounding. 2. The portion of total days of net imports covered by industry stocks. This includes stocks held for commercial and operational purposes as well as stocks held by industry to meet minimum national stockholding requirements (including stocks held for this purpose in other countries under bilateral agreements). 3. The portion of total days of net imports covered by government-owned stocks and stockholding organisation stocks held for emergency purposes (including stocks held in other countries under bilateral agreements). 4. The portion of a country’s Total stocks which are held in another country under a bilateral agreement. In specific instances, member countries can count stocks held in the territory of other countries as part of their stocks to fulfil their minimum IEA stockholding requirements (see explanation on http://www.iea.org/held.html ). Sometimes these stocks are indeed owned by the entities having the stockholding obligation; in other cases these stockholding amounts are in the form of tickets (see explanation on http://www.iea.org/tickets.html). * Sept 2005 Hurricane Katrina – Sold 11 million barrels. * 1996-97 Nonemergency sales – Sold 28.1 million barrels (5.1 million in Weeks Island sale to pay for decommissioning of storage site and transfer of its oil; 12.8 million to reduce the federal budget deficit; 10.2 million to pay for the cost of operating the SPR). * 1990-91 Iraqi invasion of Kuwait – Sold 21 million barrels (3.9 million in Oct 1990 test sale; 17.2 million in Jan 1991 drawdown ordered by president). * Nov 1985 Test sale – Sold 967,000 barrels. * Sept 2008 – Loaned 5.4 million barrels of crude to five oil companies after hurricanes Gustav and Ike cut supplies. * June 2006 – Loaned 750,000 barrels of sour crude to ConocoPhillips and Citgo after the Calcasieu Ship Channel closed and deliveries stopped to Louisiana refineries. * Jan 2006 – Loaned 767,000 barrels of sour crude to Total Petrochemicals USA after the Sabine Neches ship channel closed and deliveries stopped to Texas refineries. * Sept/Oct 2005 – Loaned 9.8 million barrels of sweet and sour crude after Hurricane Katrina disrupted Gulf of Mexico production and damaged terminals, pipelines and refineries. * Sept 2004 – Loaned 5.4 million barrels of sweet crude due to disruptions in the Gulf of Mexico caused by Hurricane Ivan. * Oct 2002 – Loaned 98,000 barrels to Shell’s Capline Pipeline to keep storage tanks full to withstand Hurricane Lili’s winds. * Oct 2000 – Loaned 30 million barrels to boost winter heating oil supplies in the Northeast. * Aug 2000 – Exchanged 2.8 million barrels of crude oil for 2 million barrels of heating oil to create Northeast Home Heating Oil Reserve. * June 2000 – Loaned 500,000 barrels each to Citgo and Conoco, after the Calcasieu Ship Channel closed and blocked crude oil shipments to Louisiana refineries. * Dec 1998 to Feb 2000 – Exchanged 11 million barrels of lower-quality heavy crude in SPR with Mexico’s PEMEX for 8.5 million barrels of higher-quality sweet crude more suitable for U.S. refineries. * April 1996 – Loaned 900,000 barrels of SPR crude to ARCO after company’s pipeline to Cushing, Oklahoma, had blockage. The Secretary may drawdown and sell petroleum products in the Reserve only in accordance with the provisions of this section. (1) Drawdown and sale of petroleum products from the Strategic Petroleum Reserve may not be made unless the President has found drawdown and sale are required by a severe energy supply interruption or by obligations of the United States under the international energy program. (C) such price increase is likely to cause a major adverse impact on the national economy. (1) The Secretary shall sell petroleum products withdrawn from the Strategic Petroleum Reserve at public sale to the highest qualified bidder in the amounts, for the period, and after a notice of sale considered appropriate by the Secretary, and without regard to Federal, State, or local regulations controlling sales of petroleum products. (2) The Secretary may cancel in whole or in part any offer to sell petroleum products as part of any drawdown and sale under this section.